If you are a deer hunter, you know the excitement of tracking down a big buck and the adrenaline rush that comes when you actually take it down. Despite being less accepted than it was in the past, deer hunting is still an incredibly popular sport. In fact, in rural areas hunting white-tail is an institution with many families, and making a first kill is a rite of passage for young hunters. You probably have your own favorite hunting spots near to where you live, but it can be exhilarating to go hunting in other parts of the country – the experience is incredibly varied, with each state having its own particular character. Here are some of the best places to go deer hunting in the United States. If you are looking for some of the largest bucks you will find anywhere, then Iowa is a must-visit destination. The deer population is not as big as some other states – about 200,000 – but you’ll be astounded by the size of the white-tail deer there. According to Iowa’s Department of Natural Resources (DNR), one of the reasons for this is that there is plenty of forage for deer in the state, and the relatively mild winters let them grow to extraordinary sizes. In fact, the Iowa DNR actually maintains a registry of big game that has been shot in the state, and will award you a certificate if you bag a deer with a trophy-sized rack of antlers. The state is also friendly to hunters – because the economy in Iowa is so dependent on farming, the state wants to keep deer populations under control to prevent damage to crops. Another great state for big bucks is Ohio – although you are only allowed to shoot one buck every year. Ohio’s program for managing deer is conservative, but this does have an advantage – because the number of kills is relatively small, the bucks can grow to extraordinary sizes there. However, this is not a recent phenomenon – one buck back in the 1940s had a rack that scored an astounding 328 2/8 points, the second-largest non-typical ever recorded. Finally, think about paying a visit to Kentucky. Not only is this a great place to find large bucks, it is also home to some of the nicest deer hunting scenery in the nation. In fact, over 6% of the area of the state – more than 1.6 million acres – is designated as game land, creating plenty of space for big bucks to grow. 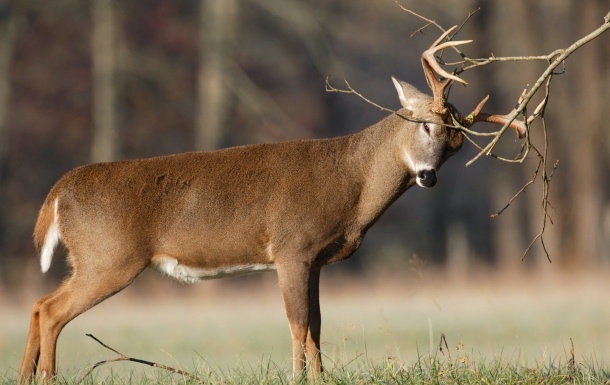 Kentucky is one of the five top states for white-tail, and produces the second-largest number of trophy bucks of any state. Good places to visit in the state include Livingston County in the west of the state, Bullitt County in the center of the state, and Breathitt County in the East.